So, I saw the Justice League movie, but not THAT one. Instead, it was the animated one from 2008, Justice League: The New Frontier, which I put on our Netflix queue years ago. There were several DC animated movies, all with a dark, adult motif, yet not as bleak as I hear the newest live-action adaptations are. Maybe that’s not fair, as I haven’t seen any of them except for Wonder Woman, but that’s the impression I’ve gotten from reviews and complaints about Superman snapping General Zod’s neck. There’s part of my mind that thinks I should watch them because I’ve seen all of the Marvel Cinematic Universe movies, but they seem to be pretty much universally acknowledged to be considerably better. Okay, I haven’t seen Spider-Man: Homecoming yet. I’m sure I will eventually, but I’m still a little annoyed at how often they keep rebooting the character, and always sending him back to high school in the process. Anyway, New Frontier had some graphic violence and cursing, but it was still generally optimistic in tone. Based on a comic series I haven’t read, it’s set in the 1950s after the end of the Korean War, and works pretty well as a period piece. There are story arcs for several characters that start out switching back and forth but gradually convene. 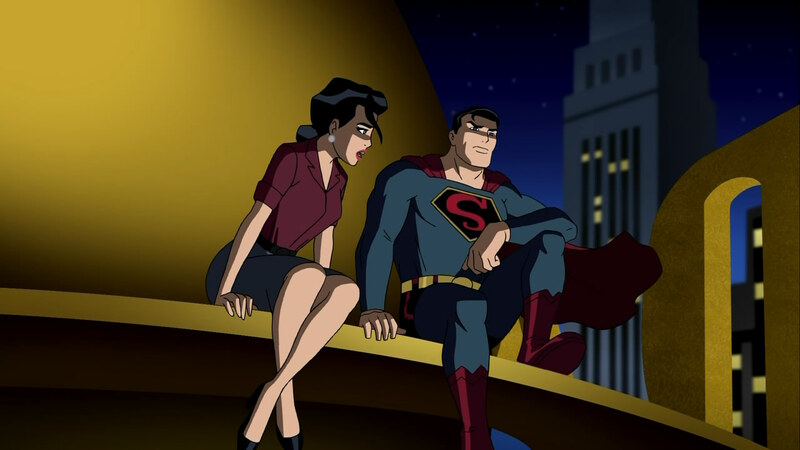 Superman, Wonder Woman, and Batman are already old hands at the superhero game; and Diana discusses how morality was simpler during World War II, while Clark complains about McCarthy. Hal Jordan and J’onn J’onzz, on the other hand, are just getting started in their heroic careers; while Barry Allen is losing the public trust. The main villain is a powerful entity known as the Centre who wants to wipe out humanity, and sends out dinosaurs to try to accomplish this goal. In addition to the heroes I’ve mentioned, there are cameos by Robin, Green Arrow, and Aquaman; and Ray Palmer’s shrink ray plays a part in the defeat of the Centre. Captain Cold makes a brief appearance robbing a casino, and while I don’t know much about him, his villain name is so dumb that it’s…well, cool. I guess he largely has the same shtick as Mr. Freeze, although he was actually introduced a few years earlier. There are some famous voices involved, including Neil Patrick Harris as the Flash, Keith David as the Centre, Brooke Shields as Carol Ferris, and, cleverly, Lucy Lawless as Wonder Woman. I wasn’t familiar with Jeremy Sisto, who did Batman’s voice; he was apparently a regular on Six Feet Under and Law & Order, but what I found interesting here was that his voice wasn’t as deep as with many interpretations of the character. Maybe his tone is closer to Adam West’s, although not really. Are any of the other DC animated films worth watching? I do know they’re pretty much all stand-alones at least up until 2014 or so. 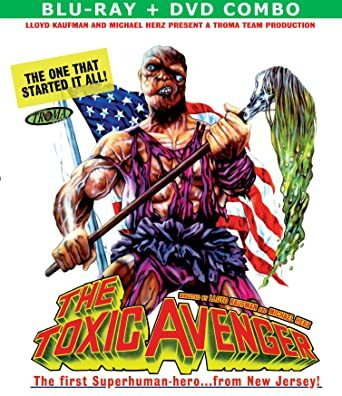 Since I’m talking about superhero movies, I might as well mention The Toxic Avenger, which I saw last month but didn’t write about at the time. I knew it was really cheesy, but I don’t think I realized how violent it was, and not just in a slapstick way (although there was definitely that as well). Some characters with whom we spend a fair amount of time run people over with their car for fun. I also kind of thought the pre-transformation hero would be more of a lovable loser, when he came across as pretty unlikable. Toxie is compelled to hunt down evil for some reason, and has no qualms with killing criminals. I can’t say I found it laugh-out-loud funny, but it was amusing enough in how ridiculously over-the-top it was. Perhaps also worthy of note are that the film used the term “white slavery” (not long before watching this, I remember having an unrelated conversation about how strange the qualification there is), and that the police chief was a Nazi who had the same reflex as Dr. Strangelove. While I never watched it, I remember when there were commercials for the Toxic Crusaders cartoon series that was loosely based on this movie and its sequels, and added an environmental theme because that’s what cartoons did around then. The early nineties were a strange time. This entry was posted in Cartoons, Comics, Monsters, VoVat Goes to the Movies and tagged aquaman, barry allen, batman, brooke shields, captain cold, dc comics, flash, green arrow, green lantern, hal jordan, jeremy sisto, justice league of america, justice league the new frontier, keith david, lucy lawless, martian manhunter, neil patrick harris, ray palmer, robin, spider-man, superheroes, superman, the toxic avenger, wonder woman. Bookmark the permalink.